Pop, Rap and Rock video director Dave Meyers tackles his second feature with this remake of the Rutger Hauer and C. Thomas Howell starring thriller from the mid-80s. As a fan of the original from back in my school days, I was apprehensive with yet another rip of a flick from the past. But, as is often the case, I was pleasantly surprised. Sean Bean is the psycho title-character and is convincing enough – although I feel Hauer owned the role far more, and should’ve been recast for the remake(!). 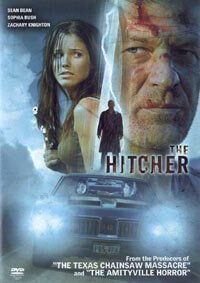 Original writer Eric Red and two collaborators gave the screenplay a twist with the solitary driver menaced by the hitchhiking madman converted to that of a young couple. It does add a new dimension and gains access to both audience genders. Many of the scenes are direct replications, while others are brand new inventions. Red also wrote the cult favourite vampire flick Near Dark. This updated version is a fun date-popcorn flick, but is hard beat to overshadow the original which has a great atmosphere all its own. Produced by the people behind other recent remakes like The Texas Chainsaw Massacre and The Amityville Horror – ie. block buster director Michael Bay and his chums. Extras: a making of documentary including interviews and on-set footage, a look at a ripping special FX sequence, and smashing car stunt, as well as deleted scenes.